MindTuxMap was built for your fingers. Most gestures are for one finger. Swipe your finger from an existing Element away. Tap on an existing Element. Put your finger on an Element and wait until you see blue arrows around the Element. The arrows will appear after half a second. Then move your finger without lifting it up and the Element will follow it. Tap on an existing Element, choose the "Options"-Button, then "Delete", confirm the dialog. Tap on an existing Element, choose the "Options"-Button, then "Pick Color", finally click at the color you would like to select. Consider the flag on the bottom. If activated it will change the color of the childrens element. 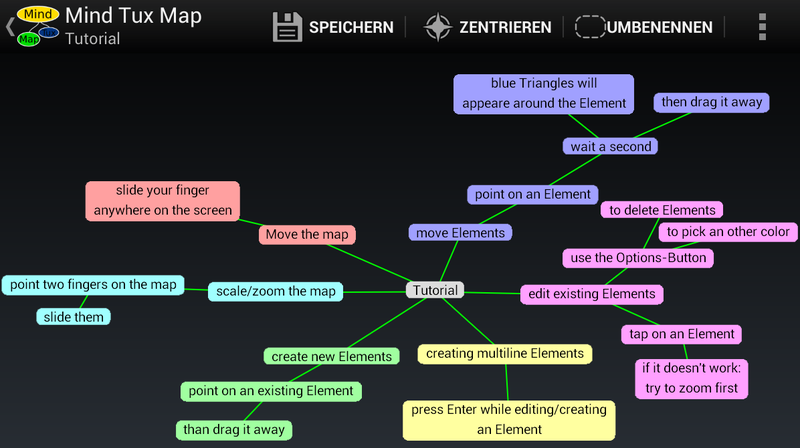 Tap the root Element of the map or choose the menu entry from the options menu. Put two fingers on the map, but not on an Element. Then move them towards to zoom away. Move them apart to zoom in. The map moves when you move your fingers. You can open the settings with the menu at the start screen. The easiest way to import a MindMap, from FreeMind or MindTuxMap, is to open/display it with the (g-)MailApp or an ExplorerApp (like File Expert, File Manager or any other FileBrowser). Enter the Directory containing your File and tap it. Select "MindTuxMap Import" and click on "just once"
You can export every Mindmap you created or imported via the menu at the start screen. If you opened your map, you can export it directly and attach it to an email if you like. If you would like to sync your Data with an cloud service (like Dropbox or others), you will have to export your Mindmap from MindTuxMap after you changed it on the device. And you will have to import it everytime you changed it on any other device. 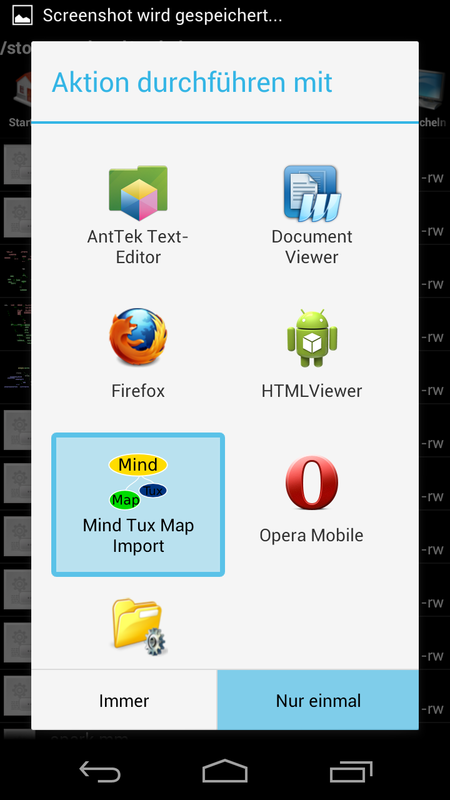 This problem is by design: MindTuxMap was not designed to support cloud storage. Write me an email to mindtuxmap@estada.ch with your suggestion and donate an appropriate amount.